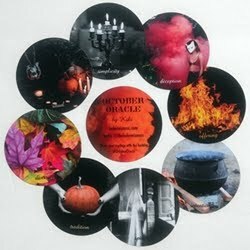 Vibrational Energy Oracle Cards is an incredible deck created by psychic medium Debbie A. Anderson, and illustrated by Heather Brewster. 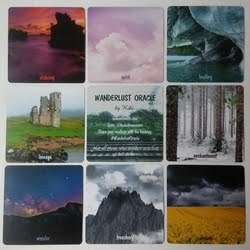 The cards are designed to guide you on your daily vibrational path. There are 52 cards, measuring 3" x 5". The cardstock is a bit stiff, yet flexible and easily shuffled. The back design is reversible, though the cards aren't meant to be used with reversals. The cards and booklet are housed in a nice sturdy box with a lift-off lid. The images in this deck are stunning. It was difficult to pick which ones to feature in this review, because I wanted to share them all. Some of my favorites are the "darker" seeming ones, like Perfect Storm and Wild and Free Wind Sprite (both shown above). I absolutely love that there is a card dramatically titled End of Days. I laughed when I saw the card titled Go to the Light. Of course it means to move toward a higher, lighter vibration, but I couldn't help but have a laugh, thinking there was a card telling me to cross over. There is such an amazing diversity of ideas in this deck. There is a card called Fairy Ring, one titled The Triangle, another named Inspired Juggler and one called Moonbeam Filled Waterfalls. There is no theme running through the deck. It is all over the place, in the most wonderful way. It feels very magical and mystical, almost like a vibrational Wonderland. You never know what you're going to come upon next. There are cards that feel dreamy, some that feel gothic, ones that feel spiritual, some that feel logical and scientific and some that feel like a fairy tale. One of the beautiful things about this deck is that it feels like a paradox. There is not one one cohesive feel to the cards - you can receive many different perspectives from them - yet they blend together seamlessly. For example, when a scientific looking card appears next to a spiritual one, you don't think of them as such. They will read together as one flawless unit. It's quite marvelous. There are some cards that feel very similar to each other in meaning. For example, three cards that feel this way to me are: Blessings, Abundant Blessings and Cosmic Prosperity. The first two in particular seem a bit redundant, unless you are looking for specifics in the degrees of your blessings. There are also two other cards, similar in imagery, yet not in meaning. Breathe Deeply and Heal Thy Self both show spiritual statues (not sure if they are both Buddha) with a lotus flower at the bottom. I don't mind this particular repetition because the card meanings are different, and the images are gorgeous and different enough from each other to feel independent. One of the cards that really stands out is The "F" Word! How great is that? Of course, most of us will automatically relate that card to a really fun curse word, but the book says that the "F" word is whatever you want it to be at the time you draw it. Whatever word that begins with F that describes your situation. "Fixated, Frustrated, Fasting, Fool, Forgetful, Fat, Foreplay, Frightened, Fanatical, Forgotten, Fugitive, Forgetful..." (I am not sure if the second "Forgetful" was a typo, or humorous irony.) The book goes on to advise you to "Take your "F" word and shout it out, so the universal vibration is released into the cosmos and move forward with a new word that will create the magnificent flow you desire." I love that. I know that for me, that card will still always make me think of the F word we are all familiar with. And I love that it has a place in this deck. As with any deck, there are a few cards that I am not madly in love with. My two least favorite cards are Musical Joy and Rain Dance (both shown in the last image of this review). The artwork in Musical Joy feels a little out of place in this deck. It doesn't seem to flow with the same energy as the other cards. And Rain Dance features a silhouette of a girl frolicking in a puddle. I so wish I loved this card, because rain is one of my favorite things in life. But the girl's arm is quite unnatural in shape, and it distracts me every time I see it. Also, the angle of her front leg seems off. She seems more like a marionette or rag doll than a human. Most of the deck images, however, I find gorgeous to the extreme, and flow together beautifully. They feel very high vibe and powerful. I love that the deck incorporates a mixture of light and dark cards, all of which feel empowering. The imagery is a combination of people, places, things, concepts, and designs, and they all elicit strong knowing when doing a reading. 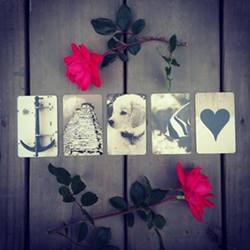 The cards are not static, but filled with depth, feeling and meaning. It feels to me very strongly as if there is an energy in this deck that tunes into you. The creator is a psychic medium, so I can't help but believe that there is a bit of her energy in the deck. These cards feel responsive, and in my experience, they spark intuitive knowing. Because of this, I think it would be a fantastic deck to use if you are trying to hone in on any of your clair senses. The cards almost feel like they live and breathe. They read like a dream. Even the flow of the colors and textures come into play in the readings. The meanings come across so simply yet powerfully. My first reading with this deck was a four-card draw. It spoke in order across the cards, like one coherent thought. The message itself, along with the ease of the flow, gave me goosebumps. One day I drew a card each from three different decks, and the card I drew from this deck completed the reading so poignantly. So it definitely plays well with others. One day I asked what needed healing, and how to heal it. The Reprogram card leaped out, so I kept it in mind for background info, as it appeared in my previous reading, so that theme was strong for me at the time. I drew Cellular Collapse for "what needs healing", and I was blown away at how literal the cards' answer was. This card is about needing physical healing. "Now is the time for every cell to heal and be well again - on all levels." Then I drew Breathe Deeply for "how to heal it". Again, the cards read me like a book. I have a terrible habit of holding my breath when I am tense, and often even when I think I'm relaxing. My poor cells are not getting enough oxygen. When I drew these cards, I knew I would definitely try to keep this very important advice in mind. The passages for all three cards in this reading (including the jumper) talk about letting go of what no longer serves you, which was the exact message I got that same day from another oracle deck. Another day I asked how I could change my relationship with money. I drew the cards Shift It and Mythical Changeling. The message I received was that I need to vibe with motion, ebb and flow, and stop believing I have to conform to society's rules about money. I need to shift my mindset and allow myself to know that nonconformity and originality can be attractive to the energy of money. That same night, I drew from another deck, just asking what I needed to know, and I drew cards titled Money and Originality. The exact same message! I did another reading (which was too long to go into here) where every card related perfectly to each spread position, as though it actually heard my questions and responded relevantly. 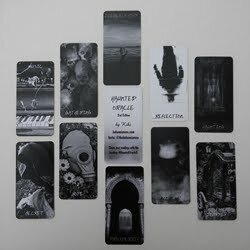 I have had cards come up in one reading, then again in another reading about the same subject, as though continuing our previous conversation. This really got me thinking that the creator didn't call this the Vibrational Energy Oracle for nothing. It feels really, really in tune with my vibration at any given time. The 80-page booklet is the same size as the cards, and has a spine and thick glossy cardstock covers. It's not one of those stapled LWBs. The book has a Table of Contents, with the cards listed in alphabetical order for easy reference. There is an 11-card spread that is original to this deck. This spread includes Mind, Body, Soul, Past, Present, Future, and 5 Vibrational Dimensions of the Soul. 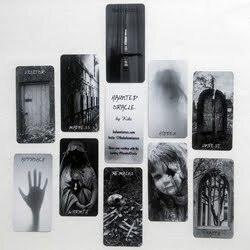 Each card gets one page, with a small black and white image of the card, followed by a paragraph of meaning. Some cards are self-explanatory (Breathe Deeply), while others you really need to reference the book (Moonbeam Filled Waterfalls). Each brief passage leaves you feeling empowered, and gives you ideas to ponder or steps to take to incorporate the card's meaning in your life, in order to raise your vibration. At the end of the book is an About the Author Page, a section on why the deck is comprised of 52 cards, and an About the Artist page. This deck is gorgeous and reads like an absolute dream. The energy that exudes from the cards is palpable. It has easily become one of my favorite oracle decks. I'm talking Top 10 Oracle Decks status (and I own hundreds of decks!). I cannot think of a single reason why you should not run out and get yourself a copy. 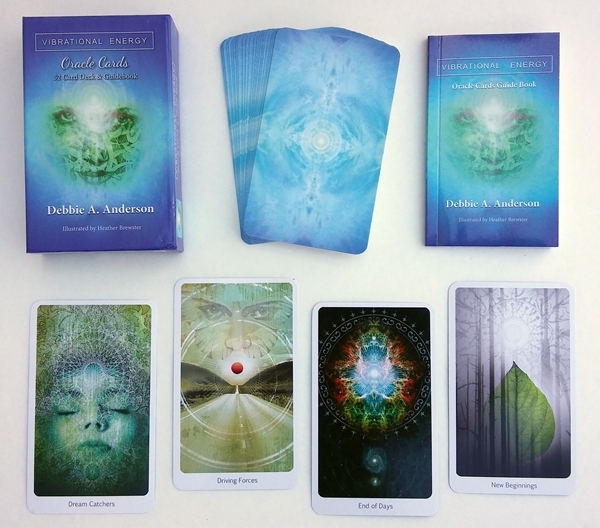 Deck: Vibrational Energy Oracle Cards, by Debbie A. Anderson, illustrated by Heather Brewster.